Daytime Trips on the "Edge"
Double D Charters specializes in offshore live baiting and kite fishing. This is a very exciting and extremely productive fishing technique. Live baits are drifted off of one side of the boat, while a kite or two is flown off the other side of the boat. Attached to the kite, through clips, are more live baits attached to your fishing line. Basically, you now have live baits all around the boat. This kind of fishing is very effective for sailfish, dolphin, kingfish, tuna, wahoo and cobia as well as many other types of offshore species. When you want to maintain a certain depth the use of a 15 ft Paratech sea anchor is deployed at the bow. Two kites with three baits each are deployed off the stern, and a deep rod and flatline are fished off the bow. This technique not only holds your depth silently, but also the wave action is absorbed by the bow while you are comfortable at the stern of the boat. Come experience the ultimate blue water fish. Swordfish are truly one of the greatest predators in the ocean. Feel the pull of a swordfish and you will be hooked for life. Typically, 5 to 6 rods with live and dead baits are drifted at night in the Gulfstream. Tackle is 80 wide Alutecnos 2 speed reels with Custom Stand-up Biscayne Rods. Daytime swordfishing is the latest craze in deep sea fishing. Come with Capt. Dean Panos who helped pioneer this fishery off of Miami. Dead bait is fished at depths in excess of 1500 feet in the Gulfstream. Braided line is used and the bait is held to the bottom with the use of a very heavy lead. Double D Charters has both electric and manual reels that are used in this fishery and the option is solely up to the customer. We even have the new Daiwa MP 3000 electric/manual reel. This reel enables the customer to reel in the fish by hand, or use the electric portion of the reel to bring up the bait or lead. Typically the swordfish caught during the day are substantially larger than the fish caught at night. If it is BIG fish you want to catch then this is the fishery for you! Double D Charters has boated swordfish over 500 pounds during the day and many over the 300 and 400 pound mark. Double D Charters also does evening tarpon trips (December - June). Tarpon trips are four hour trips, primarily after regular work hours. Tarpon are found in the various South Florida inlets and Biscayne Bay during the months of December - June. Tarpon are also fished with live bait, but the opportunity to fish tarpon with artificial baits almost always exists. Double D Charters provides full day, half day and ¾ day charters, evening tarpon charters (December - June) as well as multi-day Bahamas trips and night swordfishing trips. Double D Charters is setup to fish with a maximum of 6 anglers, although two or three anglers provide a much more comfortable and more hands on interaction. The Captain provides everything needed for a day of fishing including tackle, licenses, ice, etc. The customer should bring their own food and drink. A cooler with ice is on board the vessel. Sunglasses, hat and sunscreen are recommended. Sunscreen should be non-aerosol type as aerosol sunscreens can stain the deck of the boat. The Captain is always willing to teach as much or as little as the anglers desire. Everyone from a novice to an expert fisherman are welcomed. Double D Charters also caters to family charters. The Captain has two children of his own, and is understanding of children's special needs. There is no better way to ensure the sport of fishing than to introduce a child to the fun of fishing. Double D Charters is a proven tournament winner that is committed to providing his anglers fish to catch. The Captain wants to ensure that people will catch the fish of a lifetime. We can also custom tailor a trip to meet your needs. Special hours can be arranged as well as various combo trips such as half day sailfish trip combined with an evening swordfish or tarpon trip. Double D Charters is very flexible to allow our clients to have the best possibility of landing a trophy fish and to have the best fishing trip possible. 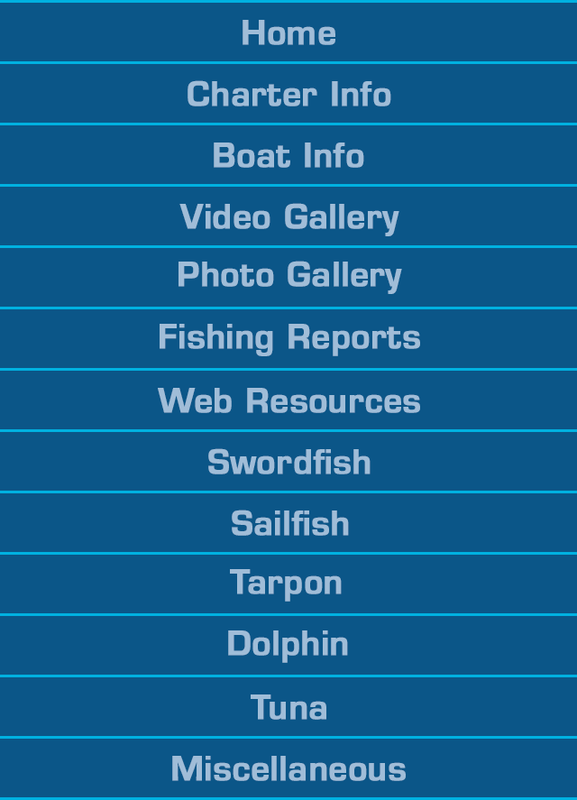 Below is a list of hours of the typical fishing trips. Bahamas Trips are only offered as multi day trips. Call Capt. Dean Panos on (954) 805-8231 or email dean@doubledcharters.com to book a fishing charter trip or to ask any related questions. Deposit can be made via check, PayPal or credit card. Refunds are returned if cancellation is made prior to 14 days before the scheduled trip. If the captain is able to rebook the trip, the deposit is refunded. Exit NW 135th Street and proceed east (from the Ft Lauderdale area, make a left, from the Miami area make a right). Keystone is just past US-1 (Biscayne Blvd.) on the right. Its just over 2 miles from I-95.